A sunny day in March and here we are, driving like fury from The Lizard, where we are staying, to Penzance in order to make a train connection. It’s our second attempt at this – yesterday we tried to get to St Erth in time to get a train to Lelant and to walk the St Michael Way – until it occurred to us that if we did, we’d be stranded in Penzance a long time before we could get a train back. So today we’re having another shot at it, and we very much hope that it won’t fail a second time. The idea is to leave the car in the seafront car park, jump on the little St Ives Branch Line train back to Lelant then walk, using the South West Coast Path and the St Michael Way, back to Penzance – a total distance of around 12-and-a-half miles. And the first part works out. We are able to park, even if our ticket will expire at 8pm. There is a train within a reasonable time to Lelant. Arriving there, we follow familiar territory from our Coast Path walking on tarmac roads from the station across to the golf course and the little church of St Uny where there are wonderful views across the Hayle Estuary and a board marking the start of today’s footpath. 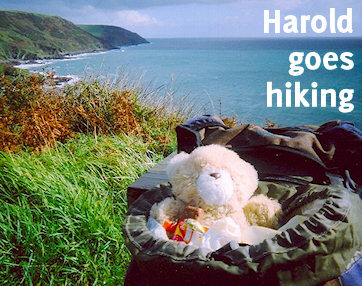 It can be tempting to revisit bits of the Coast Path that you feel didn’t get done ‘properly’ during the main walk. For us, this could include the walk into St Ives which got messed up for a couple of reasons, chiefly ill-temper and bad weather. The first part of St Michael’s Way involves retracing this bit of the path, at least as far as Carbis Bay. You start with superb views over the mudflats; the atmospheric little church of St Uny and its appealing graveyard; the dunes that run along the St Ives branch line above Porth Kidney sands and an overwhelming sense of having stepped into one of those tasteful yellow-and-blue seascapes so beloved of the upmarket St Ives artist; the fun of watching the little trains chug backwards and forwards; the experience of walking past the artist’s house just before Carbis Bay through a lush section of wooded path; the lovely beach at Carbis Bay itself and then the path towards St Ives. One of us, however, got very impatient with this section, feeling we were going over old ground, and that the walk wouldn’t really start until we got to Knill’s Steeple above St Ives. But the other half of the partnership had been angling to walk this again and, in lovely sunny weather, enjoyed every bit of it. Knill’s Steeple itself is a funny thing – a granite edifice on the moorland which was meant to be an eponymous tomb. In the end, Mr Knill was buried at Grays Inn because of difficulties over unconsecrated ground. But there’s still a festival up there to remember him every five years. His monument (“Resurgam”) is sited in a nature reserve which affords you views over a very large section of Cornwall and can easily be found by anyone with an Ordnance Survey map – another highly recommended excursion if you happen to be in this part of the world. Wesleyan Chapel at Ninnes Bridge has a bit of historical interest concerning John Wesley’s conquest of Cornwall. It is also another little tribute to human nature essentially winning through, despite all evidence to the contrary. You see, this chapel has been converted into someone’s house. They have a public footpath going right through the front garden – you have to use their front gate. But rather than trying to pretend it isn’t there, signs direct you on the right route, and the path is marked by a series of vertical stone slabs, almost like standing stones. These are people that are, quite understandably, keen that you stick to the path, but make passing through their garden a pleasure rather than a nerve-wracking chore. Next, the path passes through a number of daffodil fields. It’s spring and they are laid out in rows like lavender in Provence. Need we say more? The first view of St Michael’s Mount, a misty shape on the horizon, was a pretty special moment, although it is theoretically possible to see it all the way from Knill’s Steeple. Watching it get bigger and bigger, and eventually standing on the causeway, was magical. It’s a pity but time and tide waited for no man and we weren’t able to go over – we haven’t visited for years and it might soon be time to do it again. The approach from Ludgvan to Marazion was a revelation. The area is flat and swampy and has several timber plantations. It was obviously a Lord of the Rings kind of day, since Mirkwood was what sprang to mind for these. Marazion marshes is a lovely area and somewhere else that would reward further exploration. The main line railway tracks run through this area, and the path crosses the tracks with no bigger precaution than a “Stop! Look! Listen” notice. And finally – we knew our parking ticket would run out at 8pm. Used to walking with big, heavy rucksacks over hills, we are lucky to average two miles per hour. With no rucksacks over flat ground, we somehow covered three miles in an hour and got into Penzance minutes after eight – certainly quickly enough to avoid a parking ticket. It was a great way to enjoy ‘l’heure bleu’ – dusk, when all the yellow has gone out of the sky but before it is dark – on a straightforward route where we were unlikely to stumble or get lost.